At present, human society is facing a health care crisis that is affecting patients worldwide. In the United States, it is generally believed that the major problem is lack of affordable access to health care (i.e. health insurance). This book takes an unprecedented approach to address this issue by proposing that the major problem is not lack of affordable access to health care per se, but lack of access to better, safer, and more affordable medicines. The latter problem is present not only in the United States and the developing world but also in countries with socialized health care systems, such as Europe and the rest of the industrialized world. 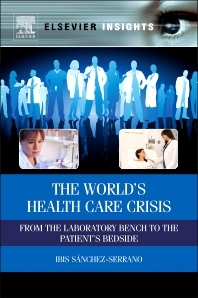 This book provides a comparative analysis of the health care systems throughout the world and also examines the biotechnology and pharmaceutical industries. The pharmaceutical industry, investment banks with an interest in healthcare, healthcare investors, management consultancies with healthcare practices, economists with an interest in healthcare, reimbursement agencies, regulatory bodies (e.g. the FDA and EMEA), government, politicians and policy makers. Ibis Sánchez-Serrano is a world-leading expert on global healthcare, pharmaceutical innovation, and translational science policy. He is a member of the Editorial Board of the journal Gender & the Genome and has written two books, The World’s Health Care Crisis: From the Laboratory Bench to the Patient’s Bedside (Elsevier, 2011) and The Core Model: A Collaborative Paradigm for the Pharmaceutical Industry and Global Health Care (Elsevier, 2019). Mr. Sánchez-Serrano has built a reputation amongst important international government bodies as an expert on the world’s healthcare crisis and the relevant solutions. He is a frequent speaker on global health care and pharmaceutical development. He has received international recognitions for his work on global health care, including a “Fulbright Recognition Award” and media coverage including CNN, C-SPAN, UNIVISION, EFE Agency, Deutsche Presse Agentur. He is the President of “The Core Model Corporation”, a health-care and pharmaceutical start-up.